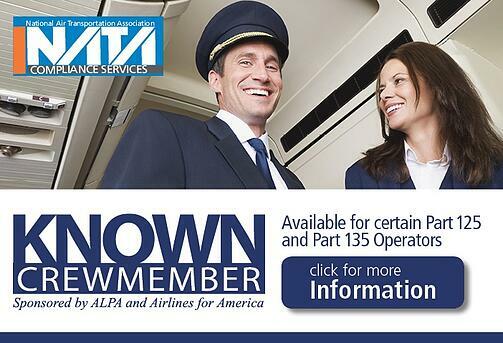 The National Air Transportation Association (NATA) and NATA Compliance Services (NATACS) is pleased to offer the Known Crewmember® Program (KCM®) to certain Part 135 and Part 125 air charter pilots. Known Crewmember® is a risk-based screening system that enables TSA security officers to positively verify the identity and employment status of flight-crew members. The program expedites flight-crew member access to sterile areas of airports, reduces passenger-screening line congestion, enhances security, and makes airport checkpoint screening more efficient for all who depend on air transportation. NATA worked in close partnership with Airlines for America (A4A), the Air Line Pilots Association (ALPA), the TSA and NATA Compliance Services to bring this valuable program to our industry. Capital City Jet Center, Inc.
Corporate Eagle Management Services, Inc.
East Coast Flight Services, Inc.
Elliott Aviation Flight Services, Inc.
ExtraordinAir Aviation & Charter, Inc.
International Jet Aviation Services, Inc.
Jet Aviation Flight Services Inc.
Mach One Air Charters Inc.
Pacific Coast Jet Charter Inc.
Scott Richard Aviation Services, Inc.
Sea to Sky Air, Inc.
Short Hills Aviation Services, Inc.
Springfield Aircraft Charter and Sales, Inc. True Aviation Charter Services, LLC.